In this, first part of a new audio series, we look at the decline of the Irish language from the Tudor Conquest of the 1500s to the Great Famine of the 1840s. Here we trace the decline of the Irish language from a dominant postion in the 1500s, to its catastrophic collapse after the Great Famine of the 1840s. In the intervening period, it had also come down in social stature. 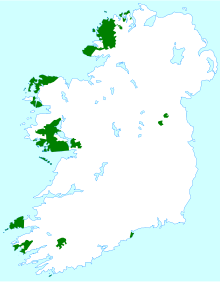 While Irish was the language of the native elite in the 1500s, by the early 19th century, it was spoken principally by the poor in the rural west. 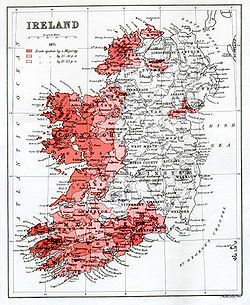 Although the absolute number of Irish speakers, at four million people, may have been the highest ever, the language had retreated completely from the east of the country and collapsed even in the west after the 1840s. Here we ask why the Irish language first lost its pre-eminent position in Ireland and then declined almost to the point of extinction. Factors often cited are the famine of th 1840s, emmigration and the introduction of English-speaking compulsory National Schools in the 1830s. However, Irish had already lost its grip in much of the country by then. Padraig Lenihan argues that factors such as the dispossession of the native elite, and the de-coupling of the language from social prestige were key factors. Fearghal McGarry notes that by the early 20th century, in Monaghan as in many other rural areas, the language was confined to the very elderly. Contributors in order; Neil Buttimer and Padraig Lenihan. While not absolutely unprecedented, the near death of Irish was very unusal for a modern European language. Here we look at the decline of the language by comparison with other minority languages. Second Part- The Irish Language, A Phoenix from the Flames? 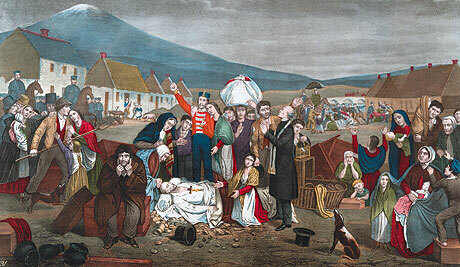 A mural depicting the Great Famine of the 1840s - a calamity which dealt a crippling blow to the Irish language. Neil Buttimer is an Irish language scholar. He has lectured in the Department of Modern Irish of University College Cork since 1982. 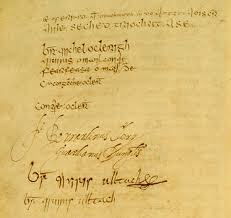 His research and teaching are in medieval Irish tradition, pre-Famine Gaelic Ireland and contemporary cultural policy. He has published The heritage of Ireland (with Colin Rynne and Helen Guerin, eds), 2000. Cork history and society: interdisciplinary essays on the history of an Irish county (Dublin: 1993), and Catalogue of Irish manuscripts in the University of Wisconsin-Madison (Dublin: 1989 ). He also wrote a chapter of the New History of Ireland on the Irish language since 1921. Fearghal McGarry is a senior lecturer in Modern History at Queens University Belfast. He has written a series of books on Irish republicanism including; Irish Politics and the Spanish Civil War, Frank Ryan, Eoin O’Duffy a Self Made Hero and The Rising, Ireland Easter 1916 and edited the collection, Republicanism in Modern Ireland. The distribution of native Irish speakers in 1871. Written by: John_Dorney on 14 September, 2010.on 7 May, 2012. 11 Responses to "The Irish Language, Part I: Decline"
The Famine and emigration contributed to the decline of the Irish language but the national schools founded in 1831 killed it completely. The Irish language was completely banned in the national schools. When it was allowed as a subject of choice due to pressure from the Gaelic League in 1900 they did not have the teachers to teach it. Hardly anyone had literacy in the language as nobody had learned to write it. So it was only in the Gaeltacht that it was taught mostly. It wasn’t until 1922 that it was given full language rights, but for teachers in English speaking Ireland to teach it they had to learn to speak it first. So standards were low and recovery slow. For a language that was banned from schools for almost 100 years we deserve credit for having retained it at all. If one listens regularly to R na G one will learn Irish..Listen, listen, listen. Radio listening along with taking a few notes is brilliant for improving what one knows. Read some short stories and poems to improve on literacy. All languge learning requires input. I believe Irish should be put on products in shops and on menus. I think there are vacancies for intepreneurs in that area to offer a translation service. I think the oral aspect of the language should be compulsory in schools and that should be a separate subject from the literary content. Students who feel so inclined could study both oral and literary Irish in the same way as students undertake Applied Maths and Mathematics. Then hopefully all students would be fluent in the language and much of the frustration which exists at present might disappear. Although I am not a historian I find these articles on modern Ireland very interesting as it was not an area I have studied. Must read the book! Hi Catilin, that seems like a reasonable suggestion, but I suspect the main problem with an Irish revival at this point is that there’s a lack of a day-to-day context in which to speak it. Even someone who was really enthusiastic would struggle to use it as their main language outside very small areas of the country. But certainly I’d agree that more emphasis on the oral aspect would improve people’s understanding of it generally. When students come into all Irish second level schools they become quite fluent in the language within three months even when they have not attended an all Irish first level school. The reason this happens is that they need to speak the language in order to fit into the schoollife – which does prove your point that because people do not need to use it in adult everyday life they lose their confidence and their capacity to speak the language. Mór an trua! But if say, the famine hadn’t happened and you’d had a great lump of the western half of the country speaking Irish in the late 19th century, this would have been a radcially different context. We could even have developed a Belgium-like linguistic divide between east and west maybe? Irish might come about again among ordinary English-speaking Irish people at such time as it might be found on every-day items such as tins of baked beans,ie, it must be given a utility value in irish daily reality; see no Irish, hear no Irish- speak no irish! I am studying Irish on Duolingo.. my grandparents came from Ireland and I am amazed how many words we used regularly as part of our Americanized -English, were actually phonetically Americanized Gaelic. Cead Mile Failte was a regular greeting in our home. It still pops into my head! I love the memories that my study of the Gaelic brings back to me. The stories from my grandparents were that it was more than discouraged… it was prohibited and enforced! ??? They came here in the late 1800’s-early 1900’s.